Olivia and Justin love traveling together in their vintage camper so a road trip elopement was the perfect fit for them. They traveled up from Florida for a Great Sand Dunes National Park elopement, located in southern Colorado near Alamosa and Crestone and parked the camper outside a rented cabin. From start to finish, everything about Olivia and Justin’s day was intentional, thought out and beautifully focused on them. This elopement might have had the most amazing details of any elopement I’ve photographed with Olivia’s stunning dried wildflower bouquet, which she made herself, her two piece wedding dress, with a fur vest from a thrift store, and, of course, the inclusion of their adorable camper. We hiked into Zapata Falls, a beautiful quarter mile each direction hike. 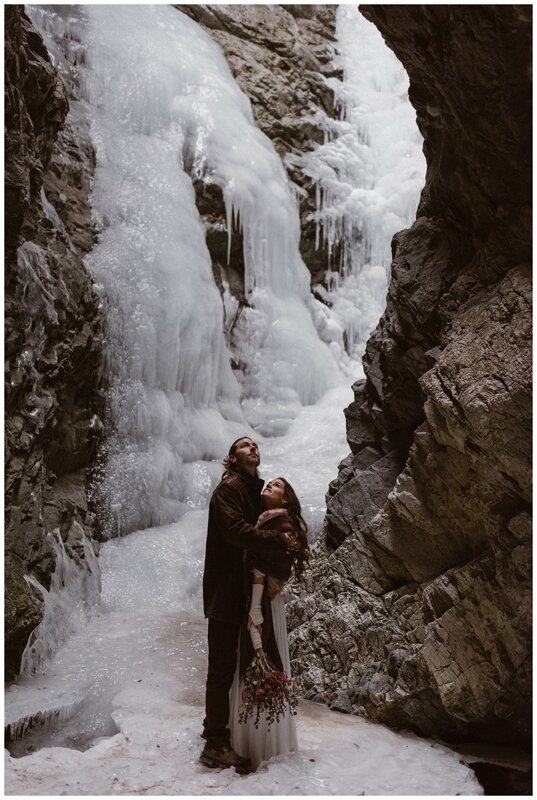 Being January, the falls were frozen but it made for a gorgeous natural ice castle and stunning scenery for photos. Zapata Falls has a completely different vibe than the Great Sand Dunes National Park, so we got two sceneries in one day and endless opportunities for gorgeous photos. We stopped by the side of the road on our way from Zapata Falls to Great Sand Dunes for more photos of Olivia and Justin inside their camper. Their story is about their love of travel and being together, about exploring and having adventures together, and the camper features heavily into the story. As we made our way into the dunes themselves, Olivia and Justin hadn’t picked a spot for where they were going to say their vows. I asked them to feel it out and find the spot that felt right. That’s the great thing about being an adventure elopement photographer - there’s no one spot where couples have to say vows because there’s no ceremony spot, no waiting guests. It’s about you as a couple and finding the spot that feels right to you. Eventually, Olivia and Justin settled on a spot in the east end of the dune field, where there are more untouched dunes with stunning mountain views. I mark the GPS coordinates for each couple where they decide to say their vows, so they have the memory of their spot. Olivia and Justin loved knowing the exact coordinates so much, they got matching tattoos of them the next day. They said their personal, handwritten and very heartfelt vows to each other in a beautiful and emotional ceremony. Everyone cried, including me. After their ceremony, I always give couples ten minutes to themselves to just enjoy the fact that they got married. We don’t take photos; I just let them be. Then they popped some champagne and we watched the sun set across the dunes before heading back to the cabin. Olivia and Justin parked their camper outside the cabin and built an enormous bonfire. When it was time for their first dance, they played their first song on a vintage record player. With gifted jars of green chile they had picked up in New Mexico in hand, we left Olivia and Justin to dance by the light of the bonfire.